Ever since the announcement came out about the Bloggers Quilt Festival, I knew I wanted to participate. I spent the past several days trying to figure out which quilt to share with you. Besides the three quilt tops I have waiting to be quilted, I have been spending more time making other sewing projects, like bags and pillow covers and table linens and curtains, oh my. I had a light-bulb moment this afternoon, and realized which one it had to be. I hope it’s not too late to make my contribution to the festival! I pieced together each block right away. 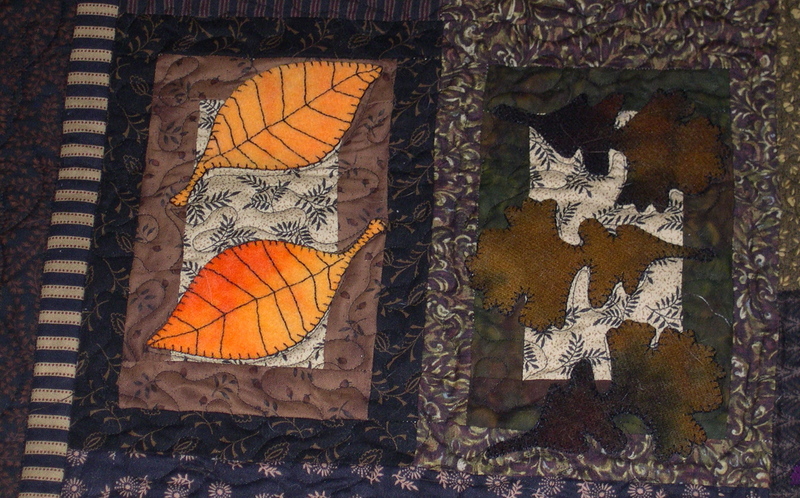 Next I cut out all the leaves from hand-dyed wool and fused them to the blocks. Then I started hand-sewing each leaf onto the block with a blanket stitch, on and off for the next several years. Finally, in late 2007, I finished it! And I love it! 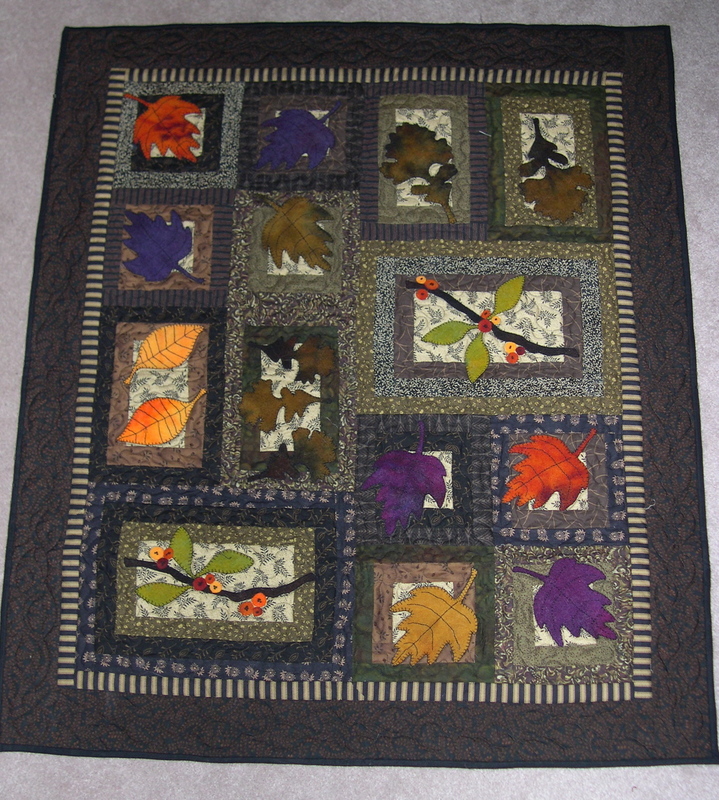 I would love to make another one with spring green leaves, which would be fun to share for the next quilt festival. But I need to be realistic about when I will have time for that project since, like many of you, I have a zillion other projects in the works. In the meantime, I will continue to cherish this one. I just haven’t settled on the right wall to hang it, so I carry it around the house, periodically draping it over the back of a different chair. This is a really great quilt! I love the pattern and can believe it took that long. Lots of detail! Wonderful work. Thanks for sharing it. It was well worth the 5 years it took to finish. Wow Wow. I just love it. It’s beautiful! 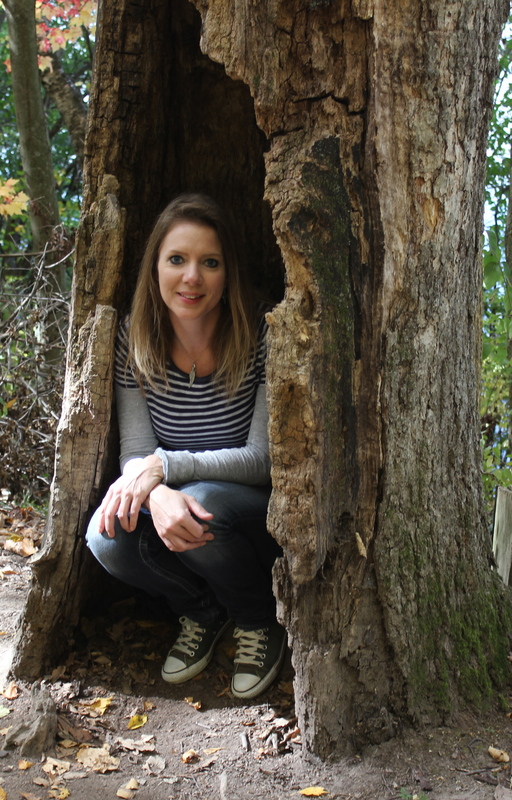 I love fall. It’s really a beauty. Well worth the wait. The colors are so intense. Nice work. Wow no wonder it took you 5 years! It is so wonderful! Love all the detail. You did a great job. It really is pretty! It looks like you did a lot of detail quilting on it as well! I hope that you get it into the festival, good choice! There is nothing wrong with taking 5 years to complete a project! Somethings grow better with age, right? I love that quilt; it’s so unique! I have been reading about the quilt festival–what a great idea! this is wonderful! I love the applique! Oh, Terri, I love this one! And I am so jealous that your Farmer’s Market has started already…we still have to wait a few weeks here in Iowa! Love the detail, you must be happy you finally finished it. Worth all the time you put into it. Lovely, Terri. Thanks for sharing. 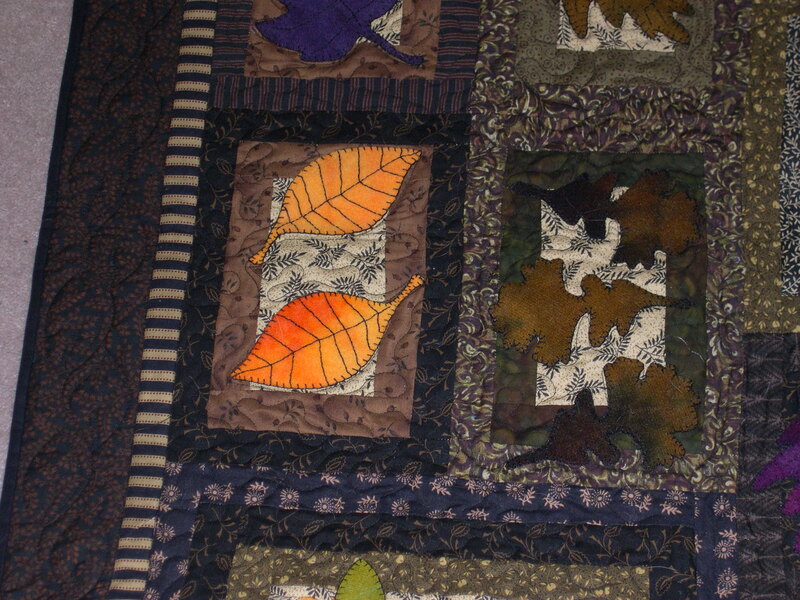 I love the level of detail and the fact that it is a fall quilt reminds me of leaf peeping in Vermont. Great quilt. Beautiful! No matter how long it took 🙂 Glad you joined in the fun! 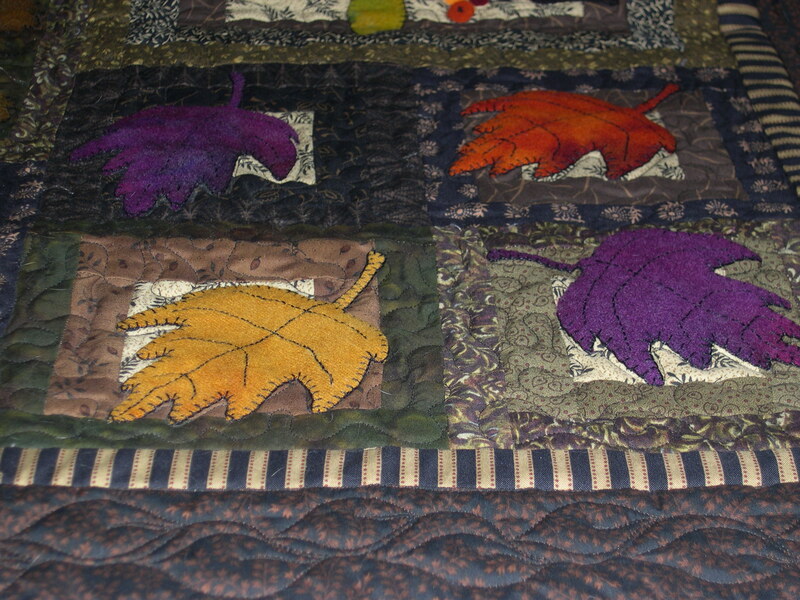 Lovely leaf quilt- there are some really beautiful leaf patterns out there- Yours is a real beauty . Thanks for sharing. 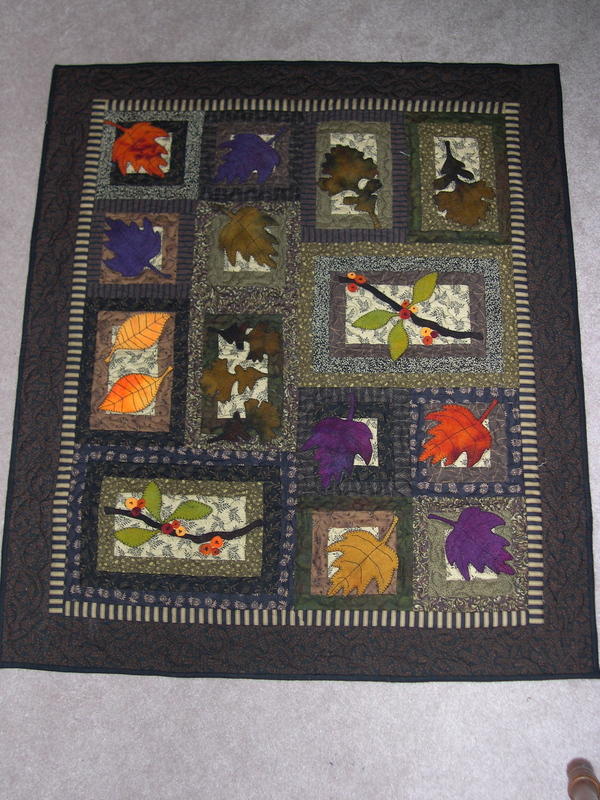 I have also posted a leaf quilt- I made it about half a dozen years ago. It is a pattern from the Australian Patchwork and Quilting magazine. I added a Maple Leaf border to it. Isn’t the Festival fun? There are so many gorgeous quilts to look at that all have interesting stories.